Welcome to the Best Western Plus Saratoga Springs! Year-round events at the Saratoga Performing Arts Center are just some of the entertainment options for guests at this Saratoga Springs hotel. For a day filled with excitement, head over to the Saratoga Racecourse and Casino to try your luck on the slots or horses. There are endless options for travelers, whether it's a lecture at Skidmore College or discovering some fine dining. Indulge in some outdoor recreation at the nearby Saratoga State Park, which is a beautiful getaway for adventure seekers. Enjoy a day out at the Saratoga Regatta/Rowing or take in the thrills of a Saratoga Horse Show. However, many guests choose to simply relax when staying at this Saratoga Springs hotel. With a convenient mini-fridge and microwave in every room along with free Wi-Fi, business and leisure travelers alike have all the comforts of home. Whether you're in town for a college graduation or a meeting with Ace Hardware Distribution, cap off your trip with a visit to the New York Ballet, just a short drive from the property. Business travelers with Global Foundries and Quad Graphics especially enjoy the warm hospitality and quality that only Best Western can provide. A prime location completes the allure. Just one mile from NY-87 and close to Amtrak downtown, it's never been easier to explore while on vacation. 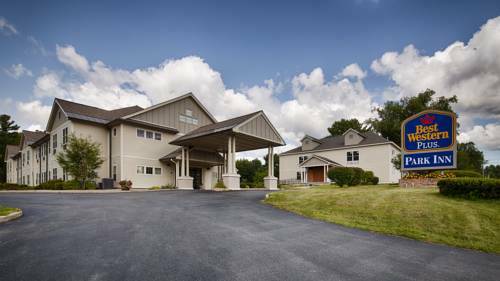 Shopping and recreation are minutes away, but peace and quiet are also on the daily agenda, since this Saratoga Springs hotel is in a quiet setting just on the outskirts of the city. Enjoy pillow-top mattresses and guest rooms with the latest amenities to make your stay as peaceful as possible. Our helpful staff members double as local ambassadors and are always happy to offer tips and recommendations on places to dine, shop and sightsee. Reserve a relaxing stay at Best Western Plus Saratoga Springs! Enjoy your stay. From: The north and south. Interstate 87 take Exit 13N, Route 9 North one mile, the Best Western Plus Saratoga Springs is on the left. From: The east. Take State Route 29 to State Route 9, travel south two miles, the Best Western Plus Saratoga Springs is on the right. From: The west. Take State Route 50 to State Route 9, travel south two miles, the Best Western Plus Saratoga Springs is on the right. 1.00 mile(s) from McDonald's , fast food, 6:00 a.m. to 11:00 p.m.
2.00 mile(s) from Esperanto, Mediterranean, Mexican, 11:00 a.m. to 10:00 p.m.
1.00 mile(s) from Morrisey, American, 12:00 p.m. to 10:00 p.m.
3.00 mile(s) from Old Brian Inn, continental, 11:00 a.m. to 10:00 p.m.
2.00 mile(s) from Chianti, Italian, 11:00 a.m. to 10:00 p.m.
3.00 mile(s) from Ripe Tomato, American, 11:00 a.m. to 10:00 p.m.
3.00 mile(s) from Friendly's, American, 6:00 a.m. to 10:00 p.m.
5.00 mile(s) from Applebee's, American, 12:00 noon to 10:00 p.m.
2.00 mile(s) from Sushi Thai Garden, Japanese, 11:00 a.m. to 10:00 p.m.
2.00 mile(s) from Hibachi, Japanese, 11:00 a.m. to 11:00 p.m.
Garden - 2.00 mile(s) from Sushi Thai Garden, Japanese, 11:00 a.m. to 10:00 p.m.
0.50 mile(s) from Saratoga Spa State Park, distinguished by its classical architecture and listed as a National Historic Landmark, is noted for its diverse cultural, aesthetic and recreational resources. ~70 miles from Saratoga Springs.